A great deal has happened since my last blog post and, unfortunately, a lot of it went on in the dark recesses of my mind which, really, isn't for public broadcast. Basically you don't want to know except to say its been a bit of a struggle to come to grips with my broken foot dilemma. Things changed yesterday afternoon and I'm feeling - for the first time in over a week - like everything will work out perfectly in good time. 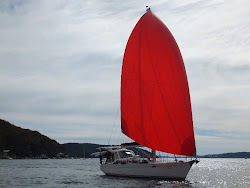 They had good weather/wind and calm seas meaning they made good time and were able to sail a good percentage of the time. One day, when the sea was very calm, they had a large pod of dolphins round up a school of fish and devour them alongside the boat. Mr G said he'd never seen anything like it before. Two whales made their presence known well off the boat and out to sea. The only ship they encountered came within 3/4 of a mile during the night but Bruce made contact over the radio with them and the ship acknowledged they had Southern Belle on their AIS so would avoid coming any closer. I talked to G last night and he said the plan was to spend the weekend at the Southport marina and then move the boat by himself up to one of the marinas in Manly. His crew of Mark and Bruce are leaving today so this means he'll be travelling up the broadwater by himself. I'm not that happy about that but there's not much I can do about it I guess. Me....well I've had a hell of a time. I went back to the hospital on Wednesday as a follow up to my emergency visit on Saturday morning. I thought I was being sent to a specialist but instead ended up in the public hospital "plaster" ward. It turns out I was there to get another plaster on my leg. The doctor on duty had a ward of 10 people with about 30 waiting outside so he could only give me about 5 minutes of his time. He looked at my x-rays and said, "you've got a bad break...stay off your foot for 6 weeks", and walked away. "Wait a minute!" I shouted. "Its already been a week and I have to get back to a sailing boat and meet my husband". He just shook his head and told me to come back to the hospital in 6 weeks....and then told the nurse to put my foot/leg in a boot instead of cast - "that will make it a bit easier for you to move around" and went on to another patient. I have very small feet. They didn't have a boot to fit me so they put a very big one on instead and sent me on my way. When my friend Jenny picked me up I couldn't help but cry all the way home. Let me say right here that I think we have a great hospital system. And, the new Royal North Shore hospital is fantastic. The care there has been very good ...But they are trying to take care of as many people as possible in as short a time as possible ....so they don't have time to talk to a woman who needs comfort and reassurance that she can get back to her vacation. It isn't fair - or right - to even ask that of them. With great encouragement from Jenny and Steph at home after the "boot" incident I called my GP and asked her for a referral to a specialist. I must have sounded desperate because she got me into someone by 4pm yesterday. He was wonderful. In 20 minutes I had a "boot" that fits and reassurance that I'd be with Mr G and the boat and our vacation within 4 weeks. Maybe not 100% but I'd be there. That's why today is so much better!